The Round Drive Residence is one of a series of ‘spec’ houses specifically designed for a developer in Los Angeles, California. 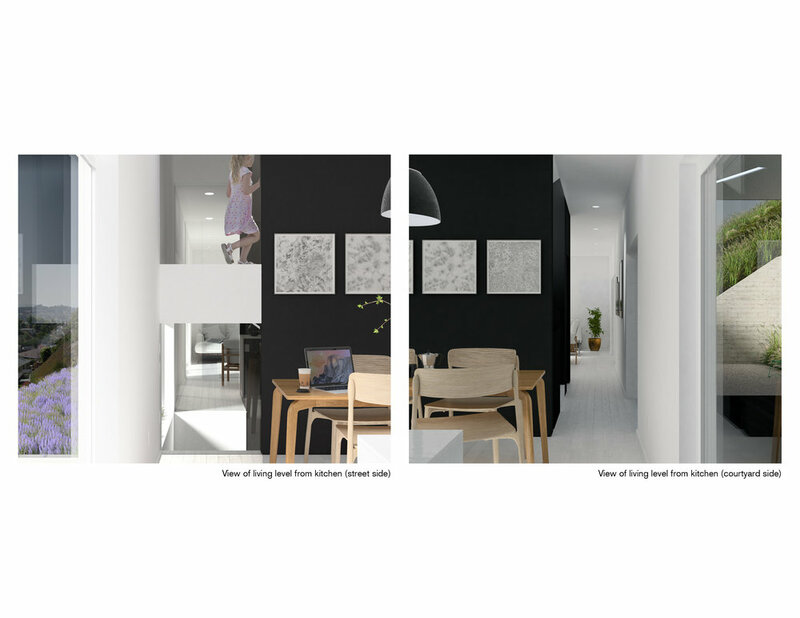 The ambition of the projects is to provide affordable progressive design in underdeveloped areas of the city by developing complex hillside lots and utilizing a mix of prefabricated modular construction and site built construction. The combination of technical and regulatory restrictions has resulted in an innovative approach to the city’s challenging hillside conditions. 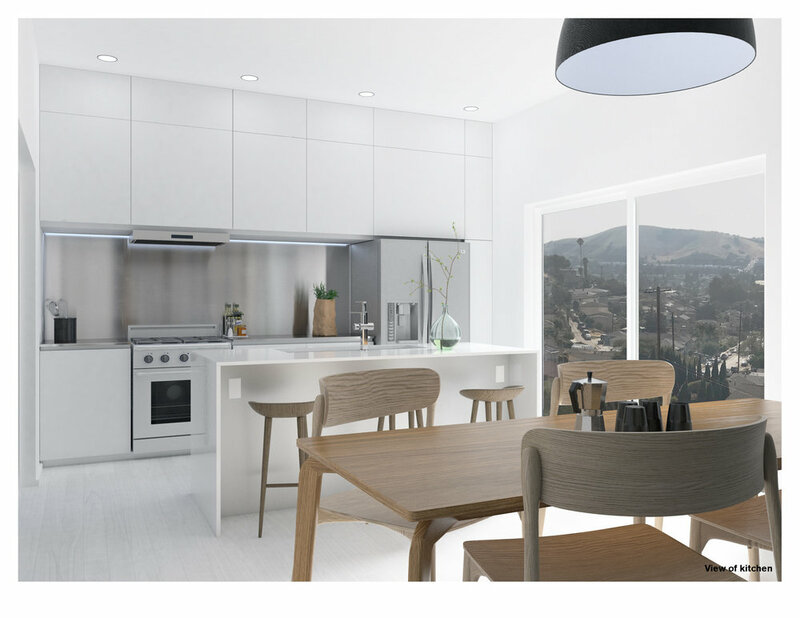 The project is situated on a steep upslope site, which is part of a three lot development, located in El Sereno northeast of downtown. The city’s hillside ordinance, as well as additional plan overlays, establishes strict limitations on development. Building height limits, setbacks, residential floor area, cut-and-fill limitations, and lot coverage limitations all played a significant role in shaping the design. 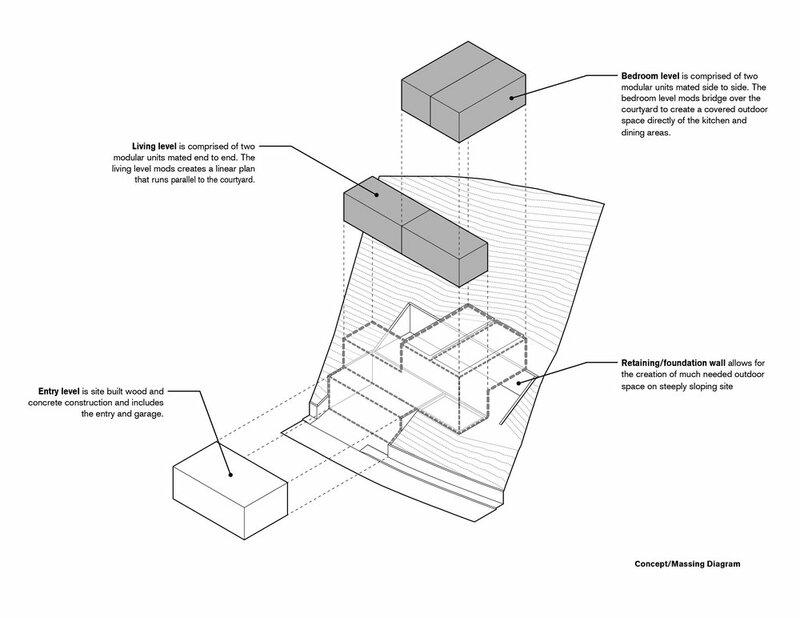 For example, the offset stepping nature of the massing and its integration with the main retaining wall on the site is a direct response to these requirements. In addition to the hillside regulations, the constraints of modular construction were a primary driver in the project’s design. The width and length, and to a certain degree the height, of each modular unit governed the approach to massing and planning. The logistical requirements associated with the transportation and setting of each unit in the tight hillside conditions required short modular units (or “mods”) with a length of no more than 32’ and a width of only 13’-8” (outside face of sheathing to outside face of sheathing). This resulted in a project comprised of 4 mods stacked on a site built garage and entry. 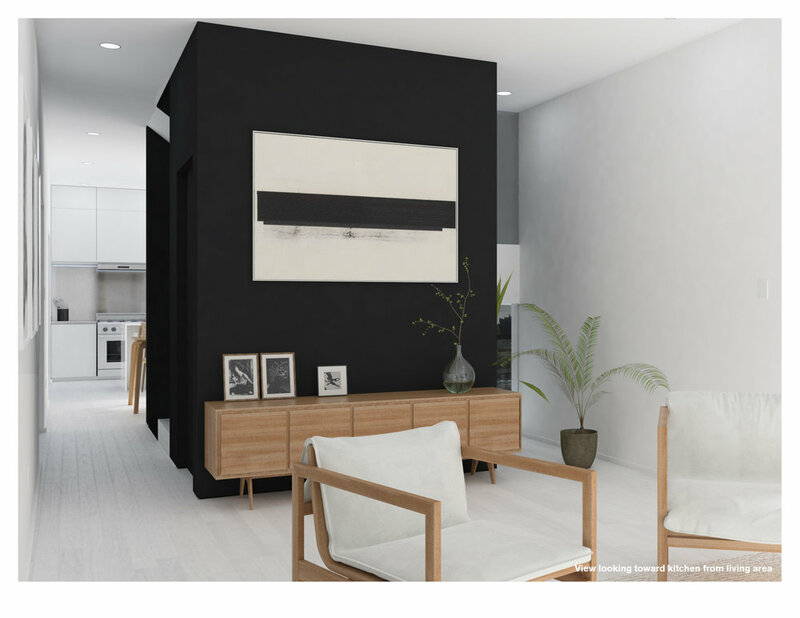 Two of the mods are mated end to end to form a linear plan configuration for the living level, which includes the kitchen, dining, and living areas. The other two mods are mated side to side to allow for efficient planning of the three bedrooms and bathrooms. 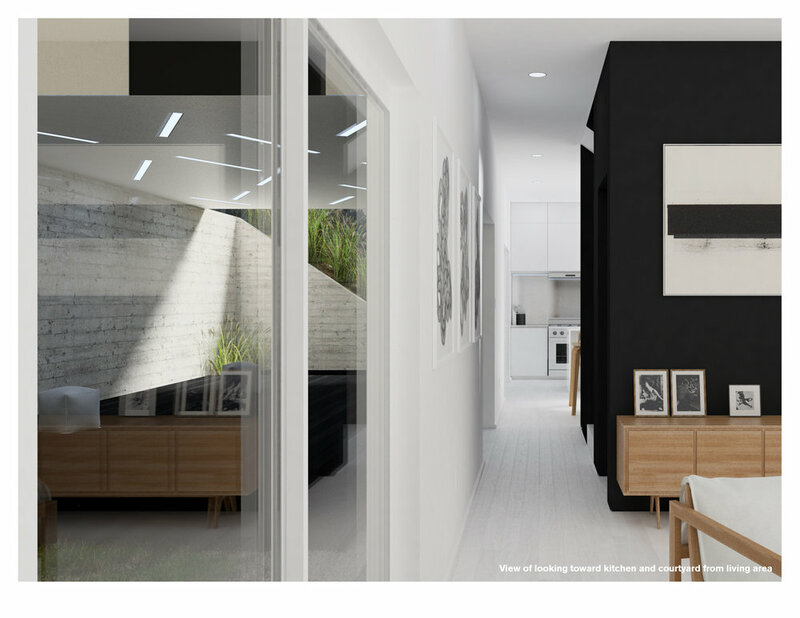 The living level mods are set away from a tall retaining wall to form a courtyard space that parallels the kitchen, living, and dining areas and is partially covered by the bedroom mods above that bridge from the living mods to the retaining wall. 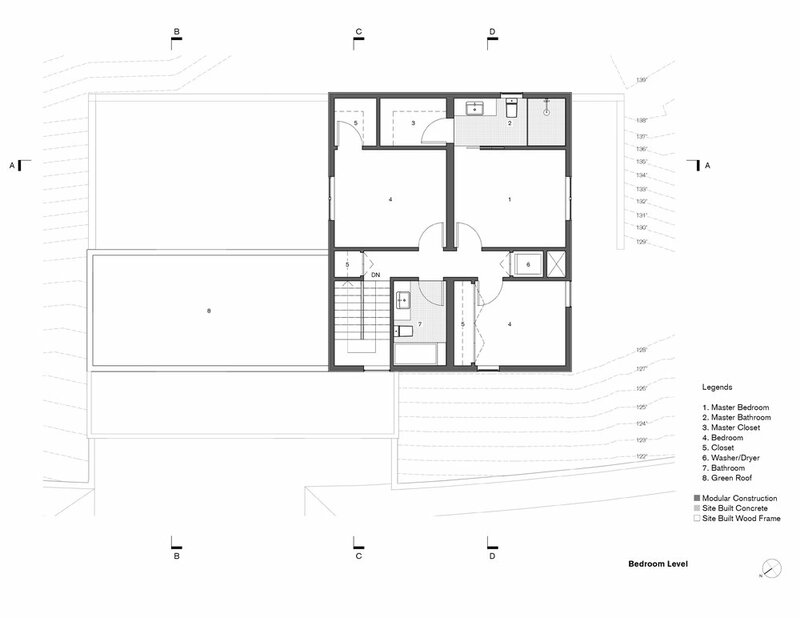 This configuration and massing of the four mods, and the creation of the courtyard space, expands the available indoor/outdoor living area on the steep hillside site. The projects’ cladding will be installed on site after the mods have been set in place. The primary cladding material will be white stucco with control joints that reinforce the block-like assemblage of the design. The stucco will also assist in abstracting the project’s overall formal quality. Openings are punctuated by dark bronze window and door frames with matching metal spandrel panels above and below, thus, breaking down the building’s scale and further abstracting the white stucco form.